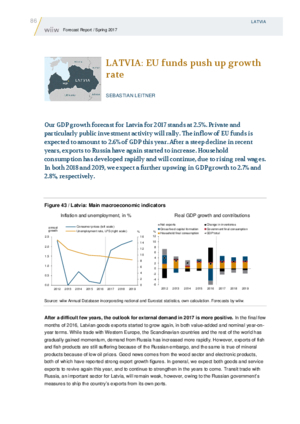 Our GDP growth forecast for Latvia for 2017 stands at 2.5%. Private and particularly public investment activity will rally. The inflow of EU funds is expected to amount to 2.6% of GDP this year. After a steep decline in recent years, exports to Russia have again started to increase. Household consumption has developed rapidly and will continue, due to rising real wages. In both 2018 and 2019, we expect a further upswing in GDP growth to 2.7% and 2.8%, respectively.